This is a picture of the devastation a fire can cause. The home was left unattended while the home owner was down south for the warmer weather. Unfortunately the house caught on fire and burned until it put it self out. This lead to a total demo of the inside of the trailer. 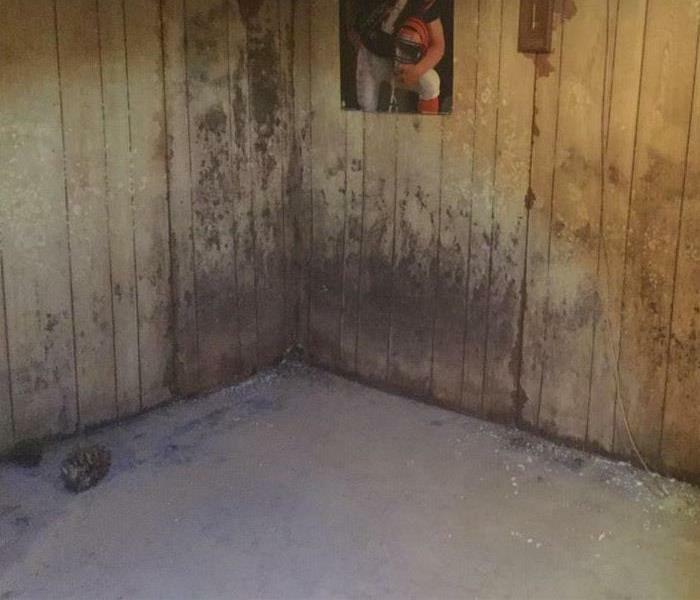 Here you can see one our SERVPRO of Bowling Green and West Lucas County in the process of removing mold that was found in this Delta basement. SERVPRO was able to enter the home and put the home owners mind at rest. Once our trained technicians were done it was 'Like it never even happened." This is the aftermath of a kitchen fire in Bowling Green Ohio. When we arrived on the scene there was significant smoke and soot damage as well as water damage from the fire department. 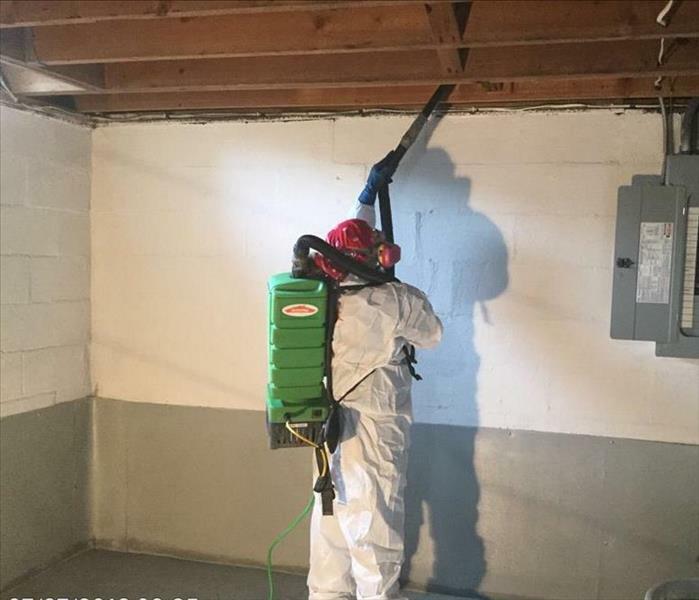 The owner could not believe how quickly our team at SERVPRO of Bowling Green and West Lucas County was able to clean up the soot from the walls and ceilings. We make disasters "Like it never even happened." This was a water damage in Lima Ohio that occurred on a Saturday afternoon. With SERVPRO of Bowling Green and West Lucas County's 24/7 service there was no need to worry. The customer was very happy we were on site within an hour. She was back to using her shower the same day. 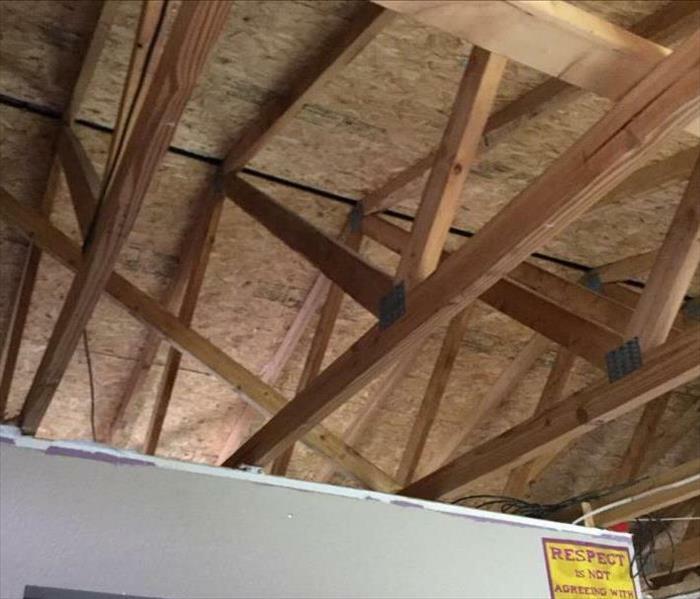 This was the aftermath of a home owner falling through his ceiling while working in the attic. The most important thing was that he was okay. SERVPRO came in pulled the remaining insulation in the area and started the cleaning process. 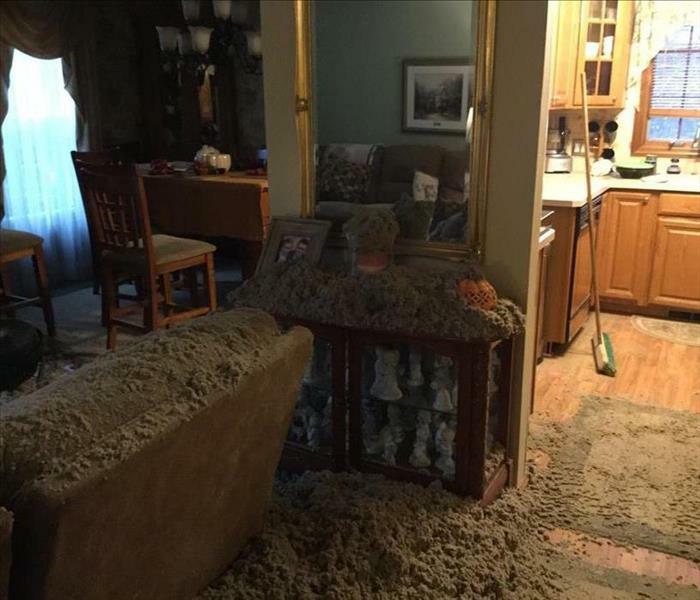 With insulation everywhere SERVPRO got to work cleaning and afterwards it was "Like it never even happened". And he was able to return to making improvements in the attic. 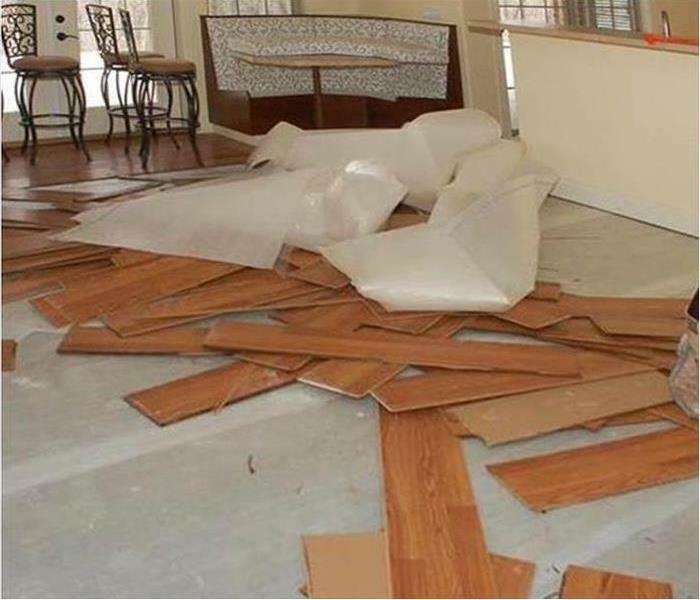 Some times when you have a water damage the carpet can be saved but the padding can not. In this case you have to carefully release the carpet from the tack strip, pull it back and get the padding out. After that you must dry the carpet and the best way to do that is to float it. We were able to save the carpet for the home owner and they could not have been happier. 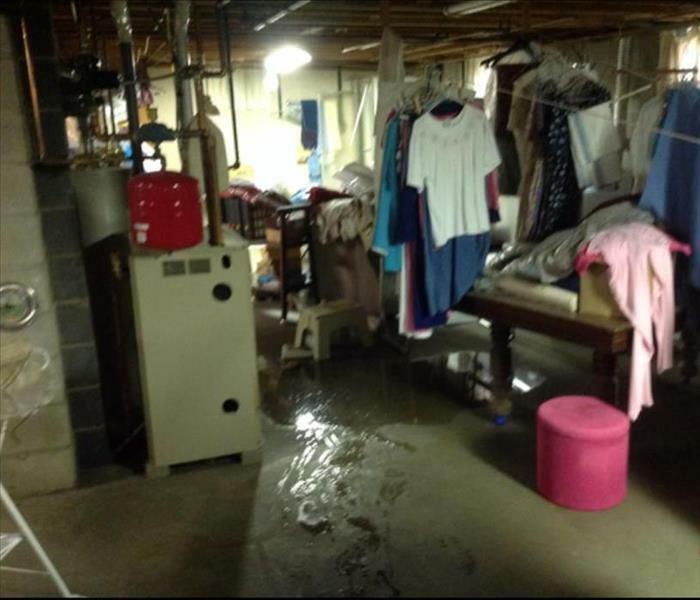 A severe rain storm caused basement flooding for many people in Delta, Ohio. This particular home was flooded due to the window well filling with water and leaking through the window and into the house. 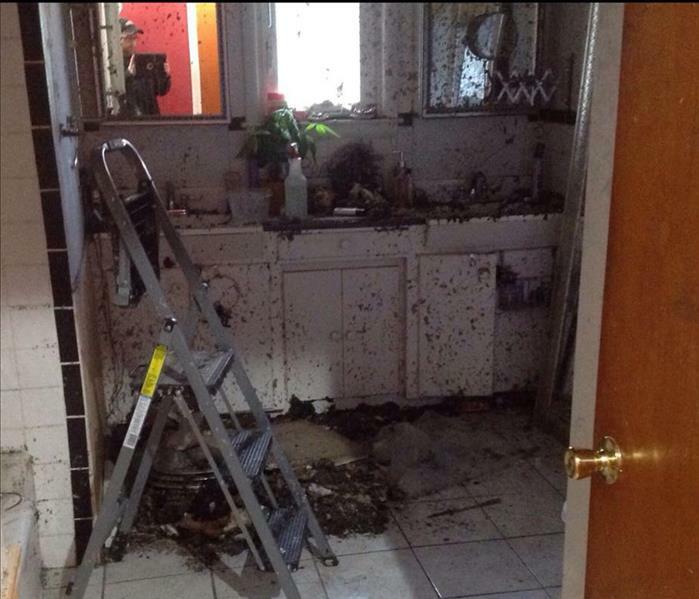 Luckily the homeowners were home and were able to call SERVPRO before the damage was too extensive. 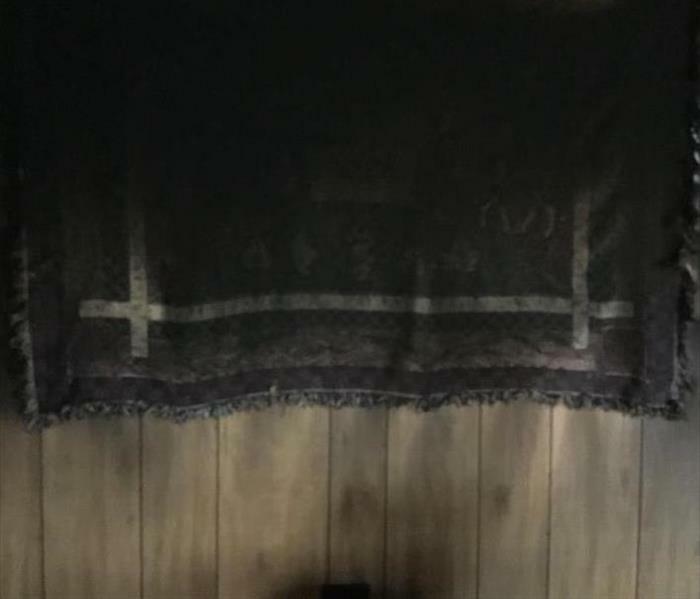 A family in Lucky, Ohio came close to losing their home after the fireplace in the family room caught fire. Luckily the family was home when the fireplace caught fire and they were able to call 911 immediately before the whole house was in flames. While their home still had a lot of damage they feel blessed they still have home. 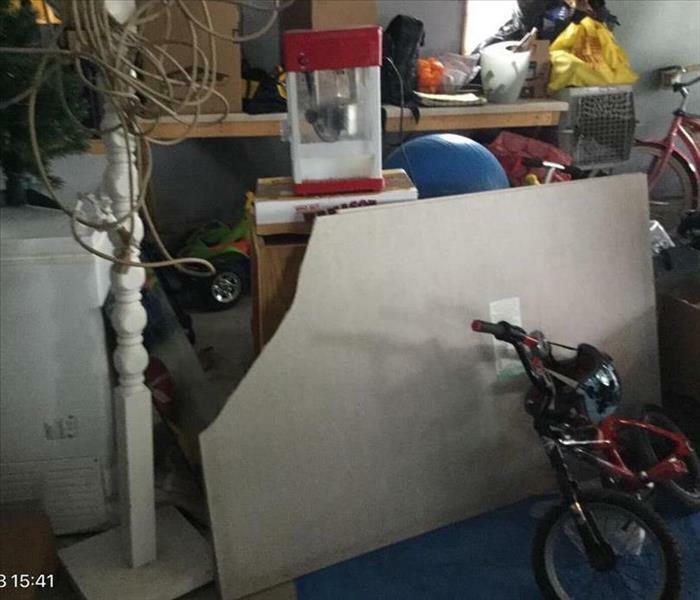 When arriving at a water damaged home you have a million things going through your mind at once and it is east to overlook the small details. Here at SERVPRO of Bowling Green and West Lucas County we take the time to make sure none of those small details get overlooked. Something as small as a 1 inch by 1 inch foam block can make a world of difference when working in a water damaged area. Not only do they assist in air flow under the object it also keeps the object from bleeding into the floor and staining it. 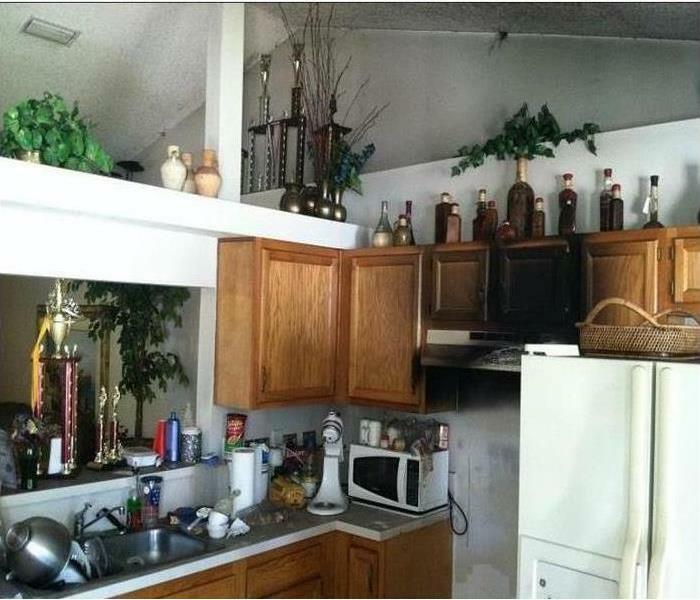 In this picture you can see that a home owner has accumulated quite a few things. SERVPRO of Bowling Green and West Lucas County was called out when she had water back up. SERVPRO of Bowling Green and West Lucas County worked for hours with the home owner to help get her home into a workable condition. After long hours both SERVPRO and the home owner was happy with the final results. Sometimes we get too much water, even after a drought. 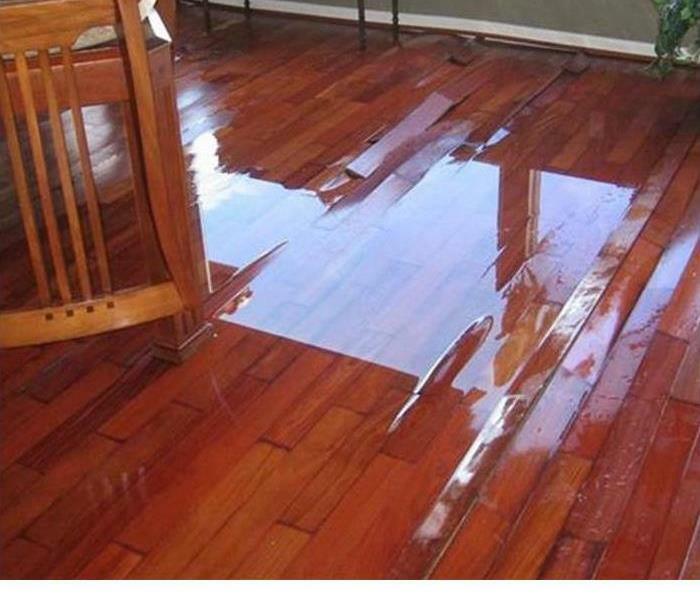 The laminated flooring was waterlogged in several different areas of the great room area on the first level of this home. 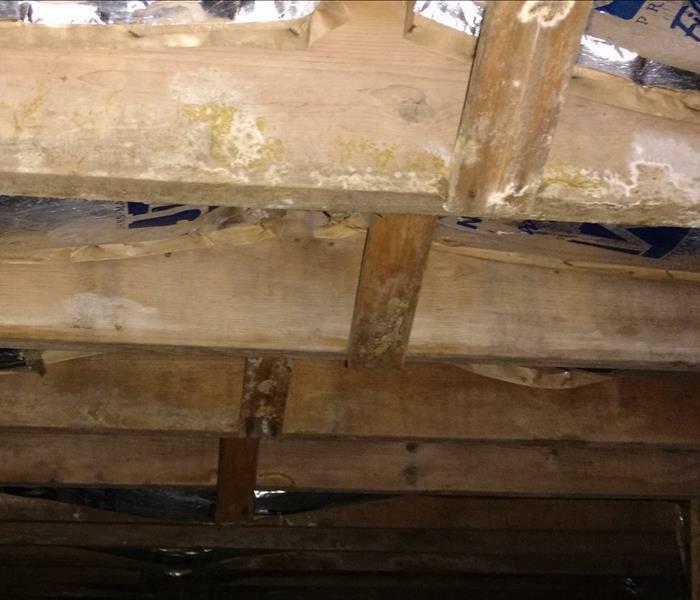 The photo shows the tear out of the slats and the vapor barrier before we installed our drying equipment. The volume of water was not great, but sufficient to ruin the flooring. 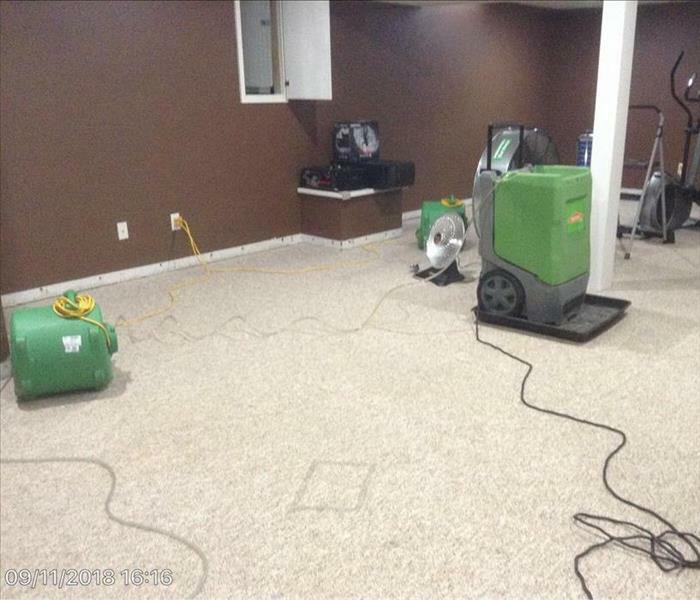 We took three days using air movers, and dehumidifiers to ensure that the concrete pad was back to normal moisture content before installing a new hardwood floor (not a laminated one.) The homeowner was extremely pleased with our neatness, and our efforts to preserve the remaining built-ins and furnishings, saving him additional costs and trouble. SERVPRO was called out to this Holland home because a dishwasher was being replaced for leaking causing damage to her floors. 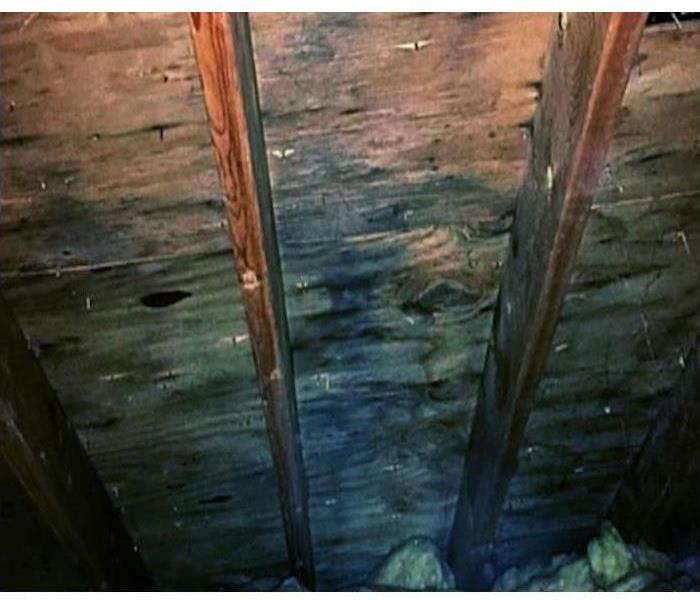 This was a leak that has been going on for a while so it also caused a mold problem. SERVPRO of Bowling Green came out that morning and had the water and mold issues cleared up by the end of the day. The homeowner was so happy she rewarded us with candy. SERVPRO of Bowling Green and West Lucas County was called out to this Holland home. The homeowner called after removing her dishwasher to install a new one and was surprised by what she found. We came out that day and had the mold taken care of before the end of the day. SERVPRO is there when you need us, no matter the time of day or night. As you can see SERVPRO is on the front line working along side other trained professionals to help get you home back to normal. We here at SERVPRO of Bowling Green and West Lucas County are here when you need us to make it "Like it never even happened." 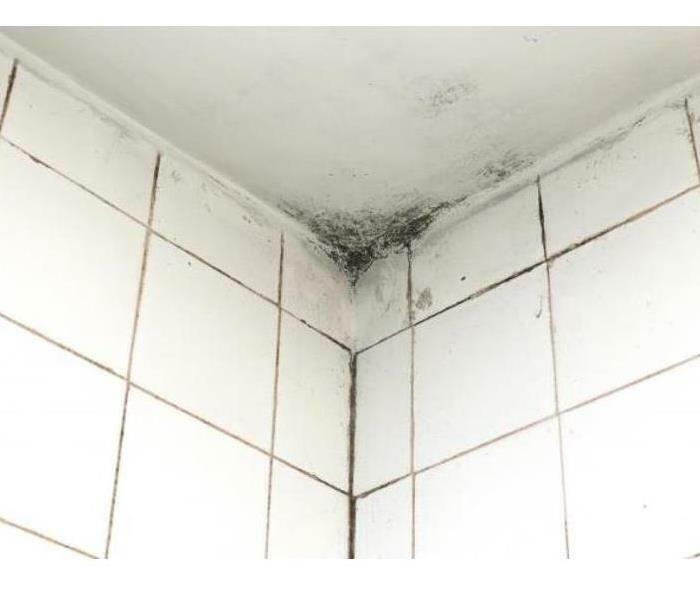 Mold is nothing to turn your nose up at. It may start out as a small affected area, but left unchecked it can quickly grow into a major problem. Causing not only an eye sore but also health issues. 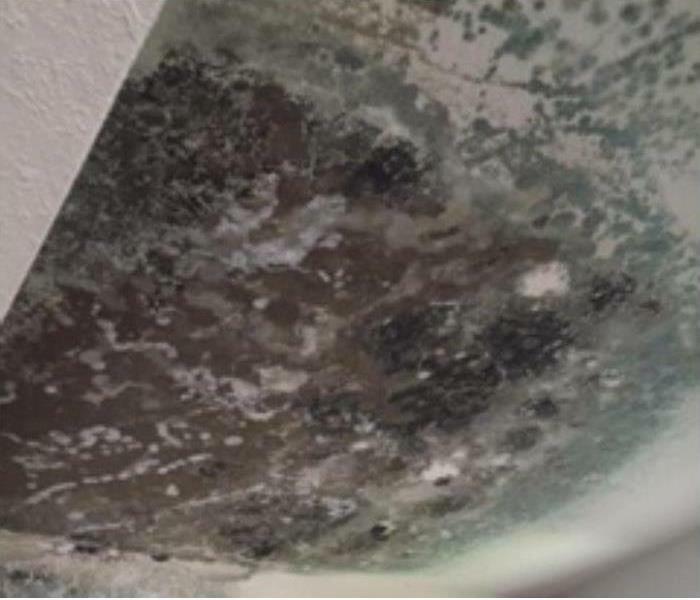 If you encounter mold in your commercial or residential location give SERVPRO a call. 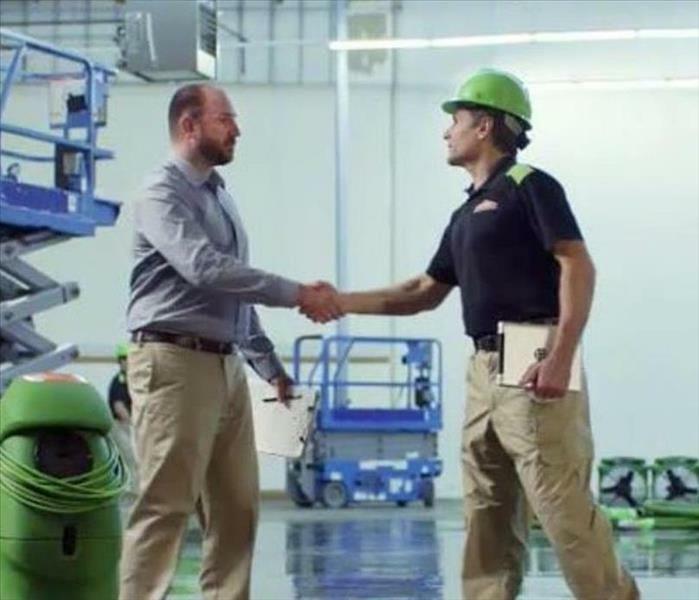 When commercial storm and water damage occur in the West Lucas County area, SERVPRO can respond quickly. 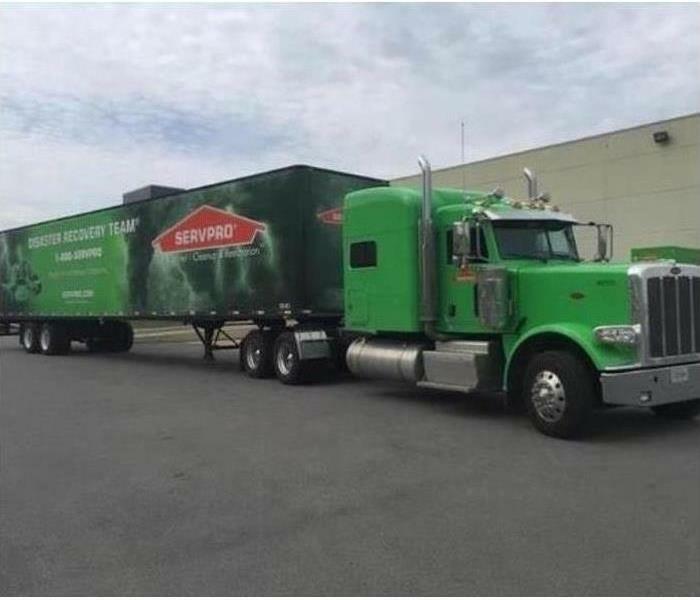 Our national slogan is “faster to any disaster” because we are part of national network of franchises which can access the SERVPRO Disaster Recovery Team on a moment’s notice. These teams are equipped with the equipment and knowledge to deal with any size disaster. 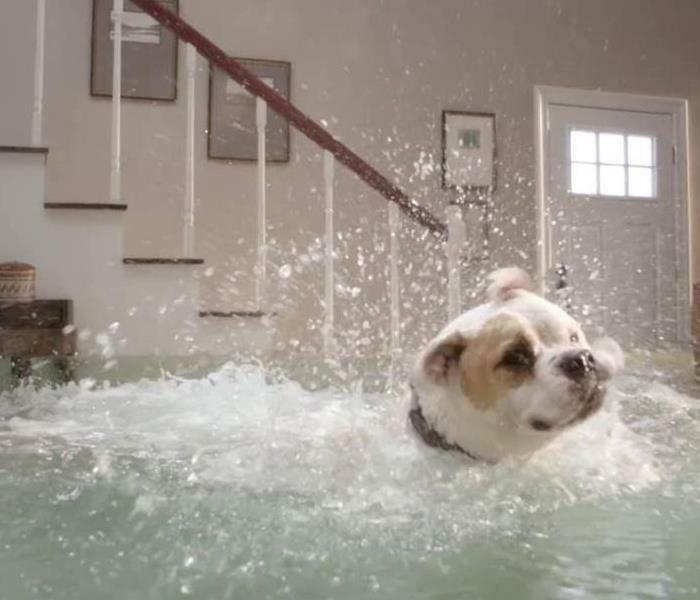 If water damage strikes your home or commercial facility, call SERVPRO of Bowling Green and West Lucas County at 419.867.8678. We provide 24-hour emergency service. This job was a water damage caused by a toilet supply line. The family was away for couple days while the supply line failed. 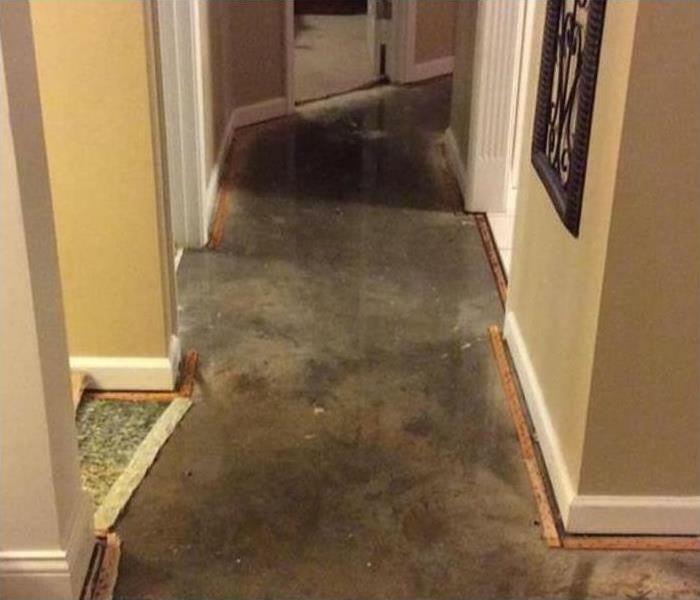 The water pooled for a couple days in the hallway and did enough damage to the carpet that it could not be saved. We also removed the carpet pad. baseboards were detached shortly before placing drying equipment. The drywall was saved even though the water wicked up the wall system 3 feet. This job was a flood damage to water intrusion from a freak storm that passed through West Lucas County. 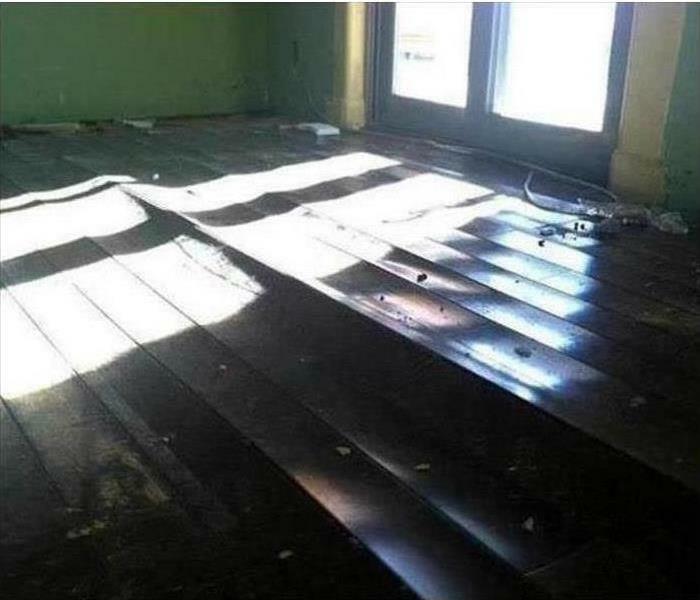 Unfortunaley the flooring could not be saved. We removed the flooring and 24 inches of drywall from the ground in this room to access the wet insulation. Equipment was set to removed the rest of the moisture in the concrete before new floor system was placed. Customer was very happy with the results. 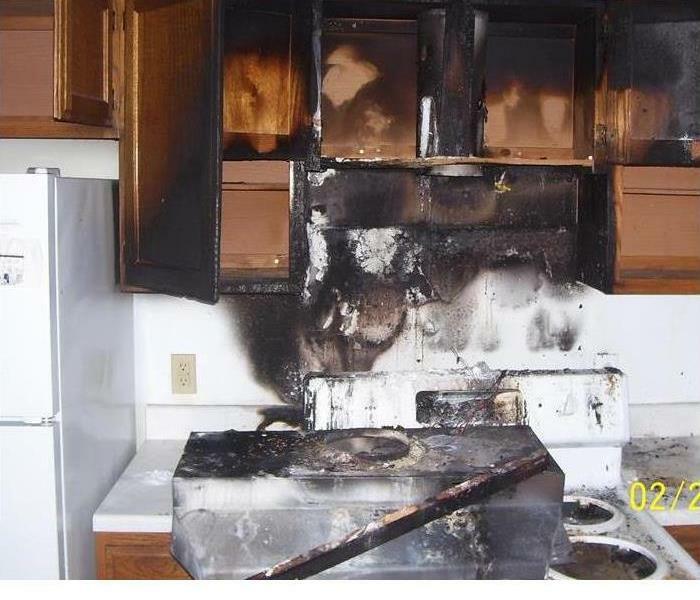 This job was a kitchen fire in Swanton Ohio. Smoke affected the entire house. 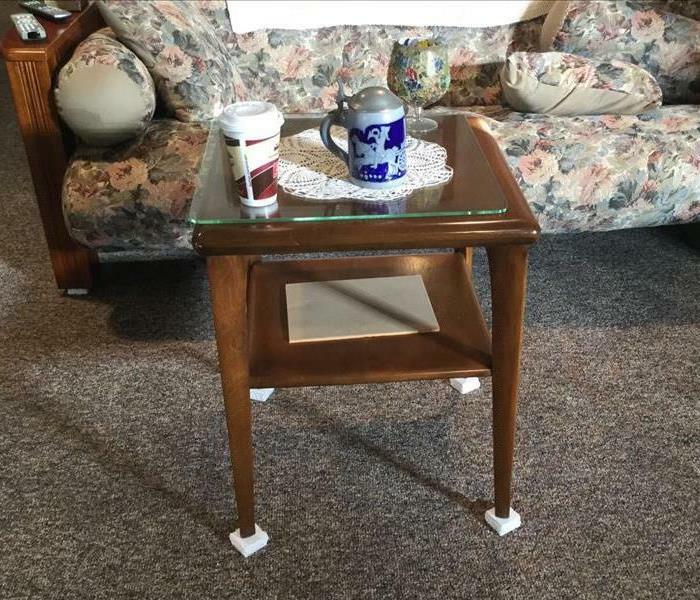 We had the task of removing and restoring the damaged materials and contents. 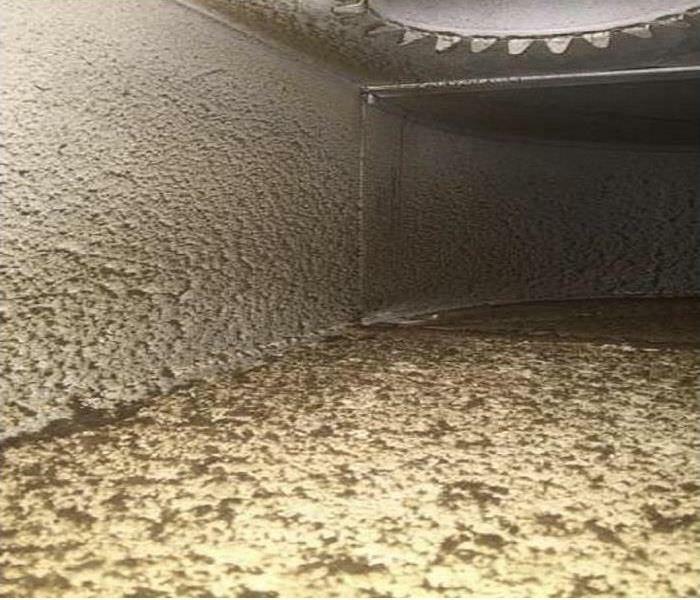 Entire home was professionally cleaned to remove soot and carbon smoke odor. Customer was happy with our work. 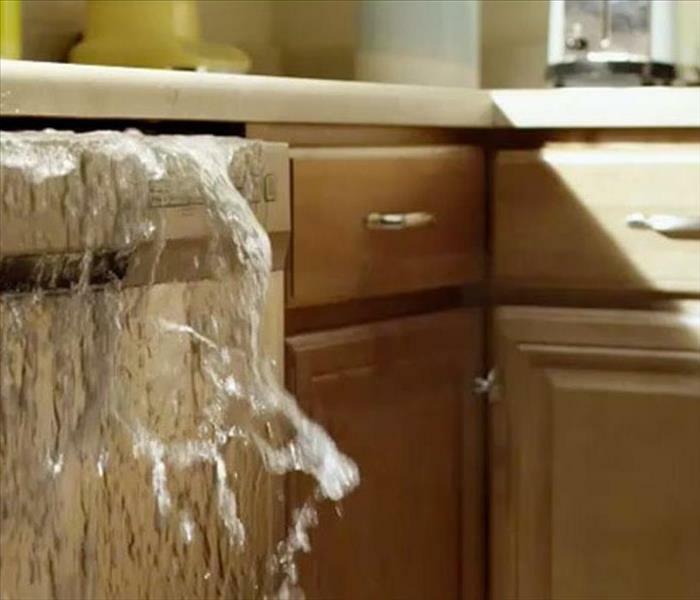 If your Holland property has been damaged by water caused by flooding or water leaks, SERVPRO of Bowling Green and West Lucas County has the experience, expertise, and equipment to restore your property properly. Our water removal and cleanup process also provides validation and documentation that your property is dry. 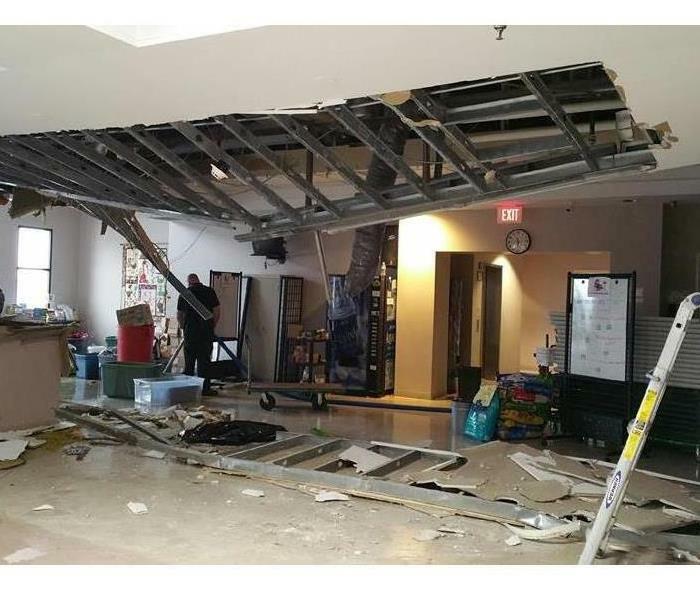 As you can see here a area animal shelter had a bit of a issue with their roof. Luckily all the workers and animals made it out safely. If you even have a commercial water problem give SERVPRO a call. When a storm hits everything is affected including your pets. Make sure to have a plan ready for your family and your pets. Hundreds of animals are lost each year when a storm hits. Be sure to have a safe and secure place for your furry friend. Storm damage is not just water. As you can see from this picture when a storm rolls through more can happen then just water damage. None of the family members were injured but it could have been much worse. 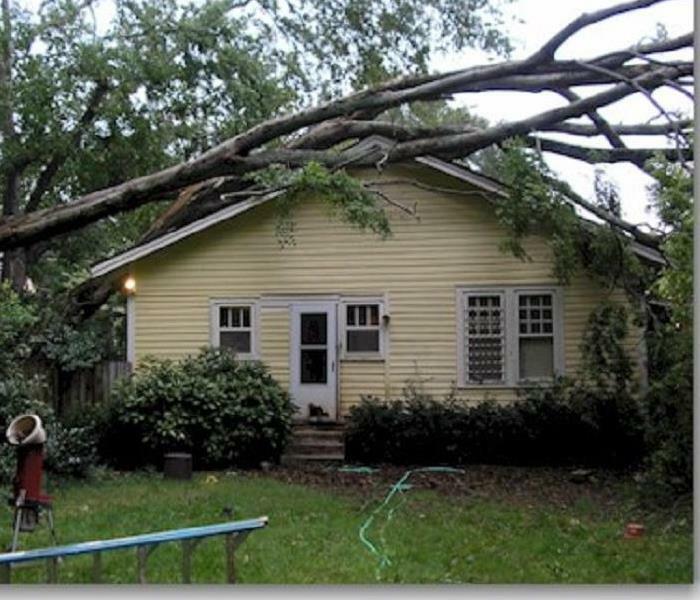 By cutting back dying or dead trees you can help prevent this from happening to your home. 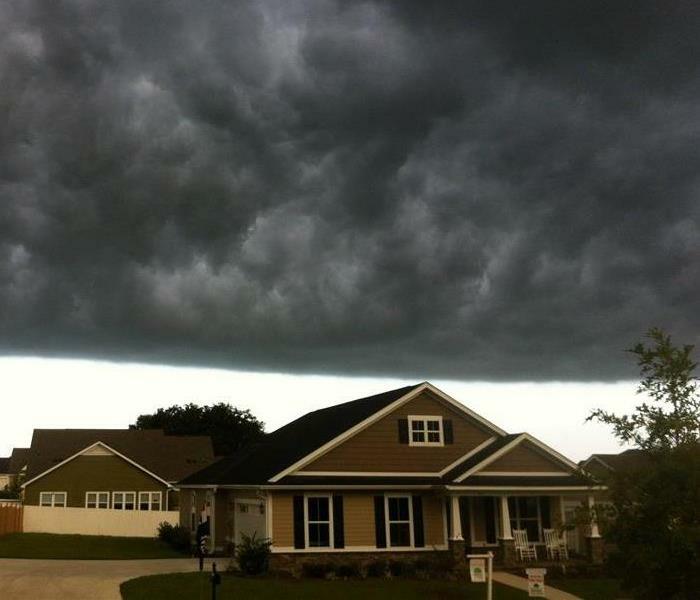 Here is a picture a client took as massive storm clouds started to pass over their house. Within 30 minutes their house was in the middle of a downpour. Luckily the homeowners took the steps necessary to keeping their home and belongings safe. 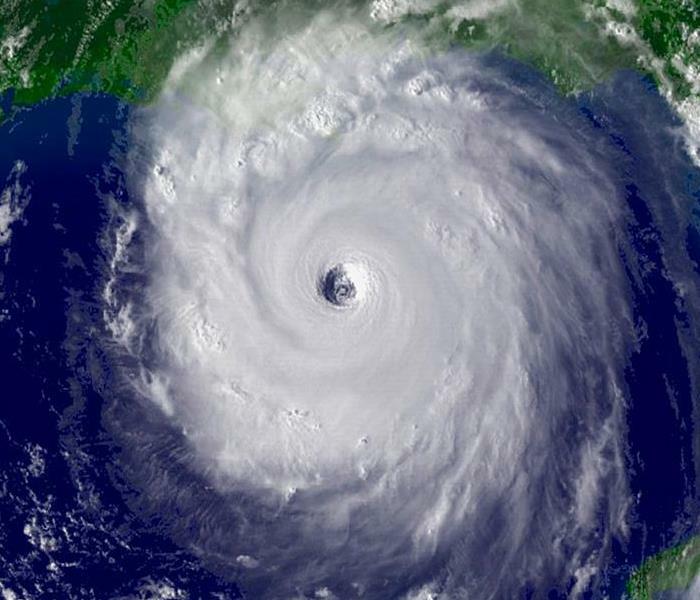 Its hurricane season so here at SERVPRO we would like you and your family to stay safe. Right now is the time to get a plan together for a safe evacuation if needed. Online you can find many resources to help you and you family with this. 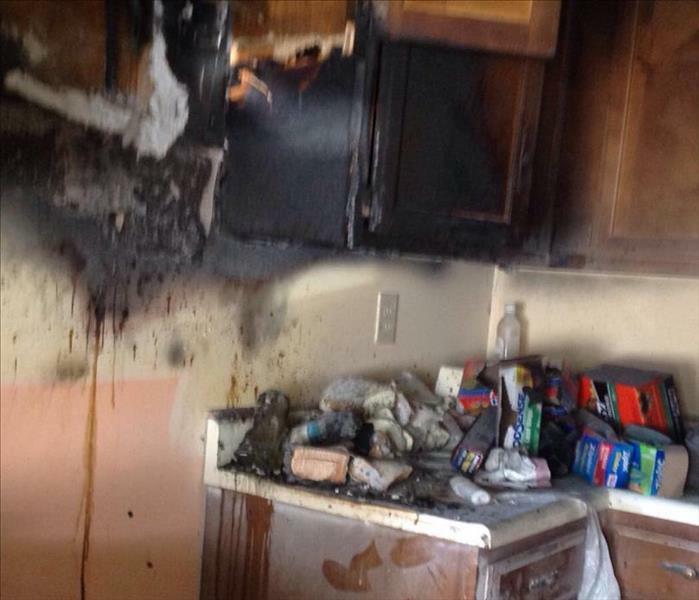 This is a photo of a kitchen fire that was caused by an electric skillet being left on while the homeowner was away at work. It was assumed that the remaining food became so hot and dry that it in turn ignited, as the flames grew the adjacent cabinetry became engulfed by the fire. By keeping your stove top clear you can help reduce the risk of fires. Many companies will offer to come into your commercial or residential property to clean your carpets however if they do not properly vacuum and prespray the results will be less than perfect. 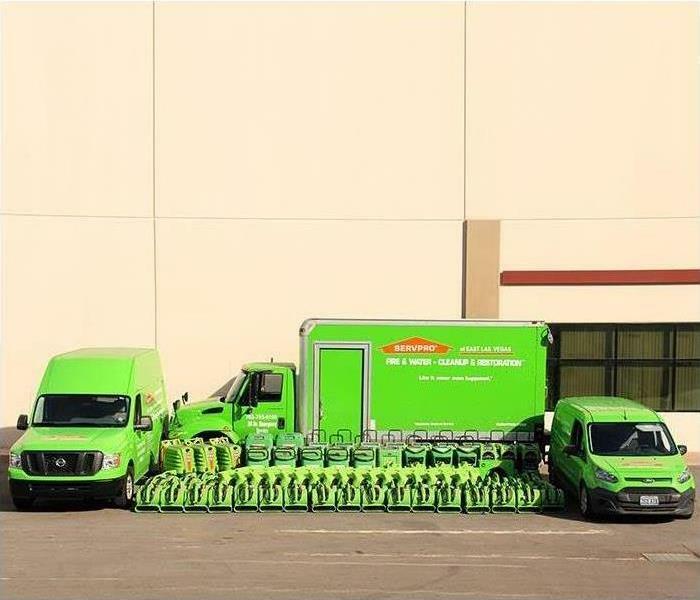 We at SERVPRO know the importance of preping to complete a professional quality cleaning. No other company has the resources and training that SERVPRO corporate offers to our franchises. All of the SERVPRO cleaning products aredeveloped and testedby in house chemists who vigilantly work to keep us on the cutting edge. 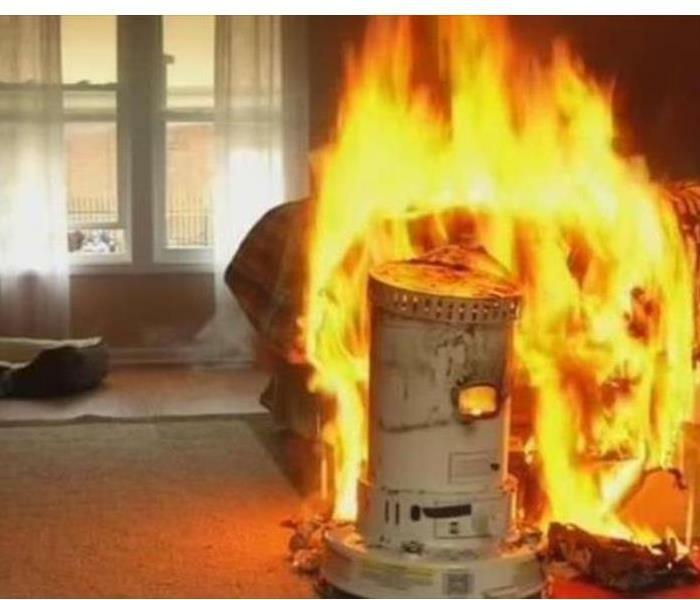 This picture shows how dangerous space heaters or kerosene can be. Make sure to read the owners manual for all space heaters big and small. This could mean the difference between sleep through the night and getting woke up by blaring fire alarms. 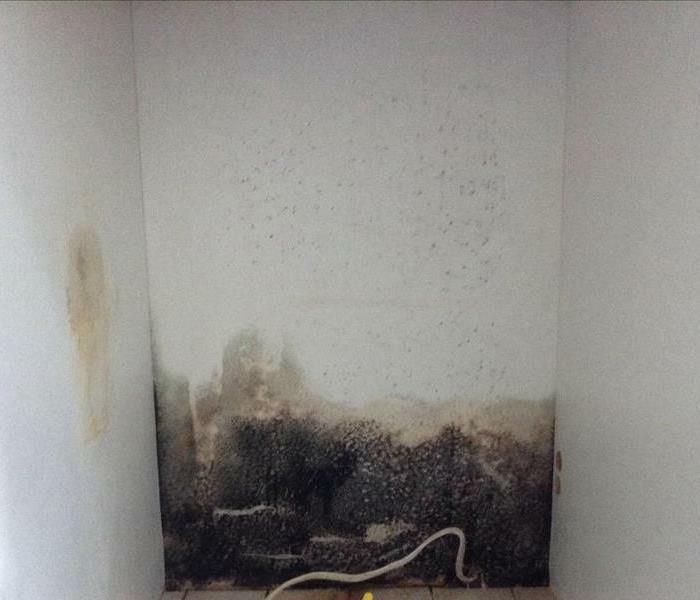 In this picture you can see what happens when a moisture problem that leads to a mold problem goes unchecked. SERVPRO was able to come out and make the disaster "Like it never even happened." This is a crawl space that was getting work done by another company when they noticed mold. The company informed the homeowner. The homeowner contacted SERVPRO of Bowling Green and West Lucas County. SERVPRO was able to come out and get the work done the same day. From jobs big to small, we do it all. 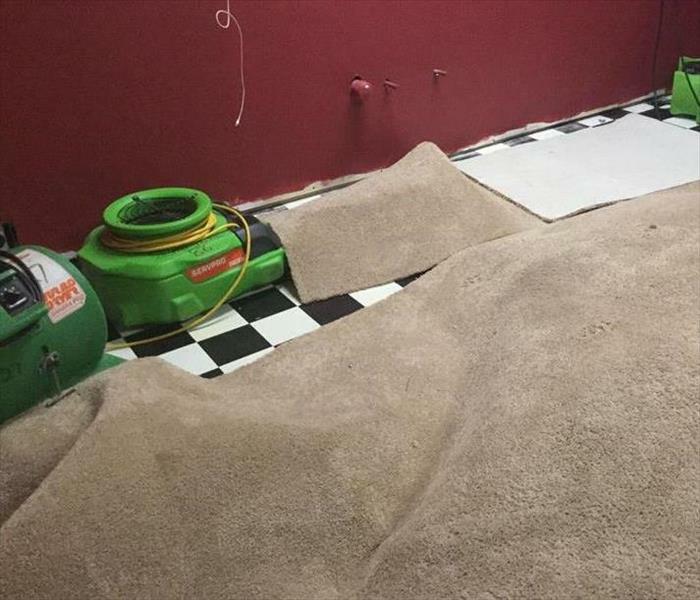 SERVPRO of Bowling Green and W. Lucas County is here to help from carpet cleaning to backed up toilets, we will make the problem "Like it never even happened." 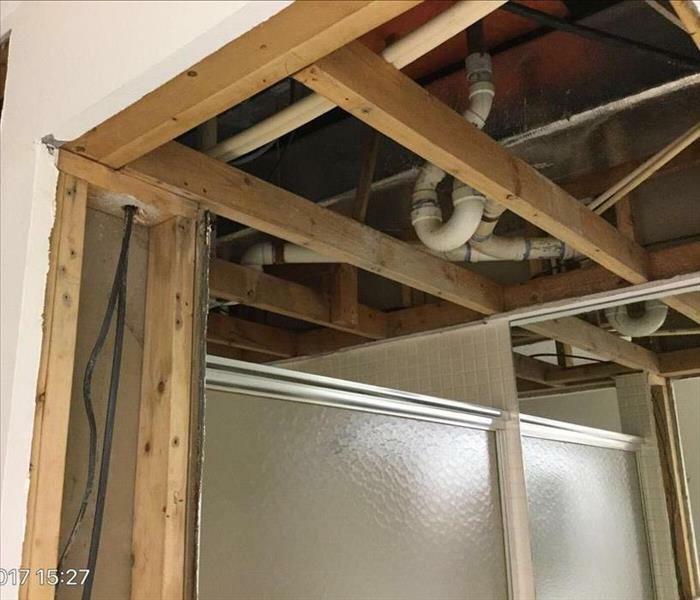 A second floor bathroom in Lucky Ohio caused a main problem. 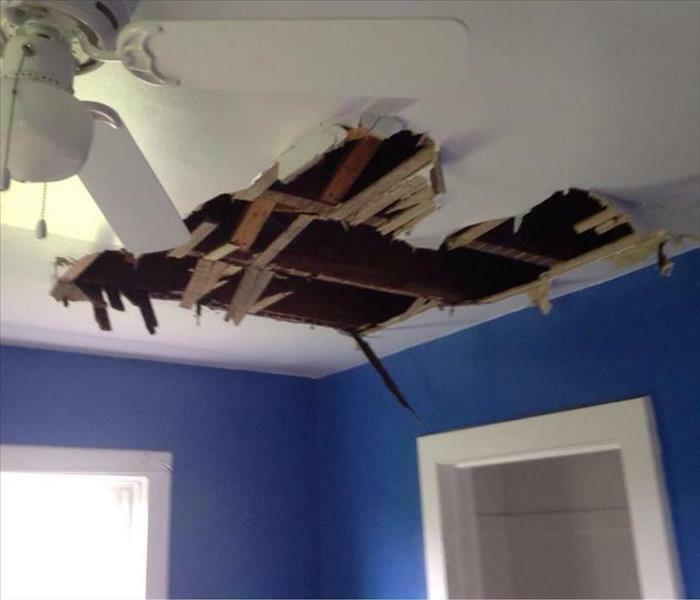 The owner was went to visit relatives for Christmas for a week and returned home to a hole in the front room ceiling. SERVPRO of Bowling Green and W. Lucas County was there the same day to help put the home owners mind at ease. When all was said and done SERVPRO made it "Like it never even happened." Here is a kitchen fire from Delta Ohio. 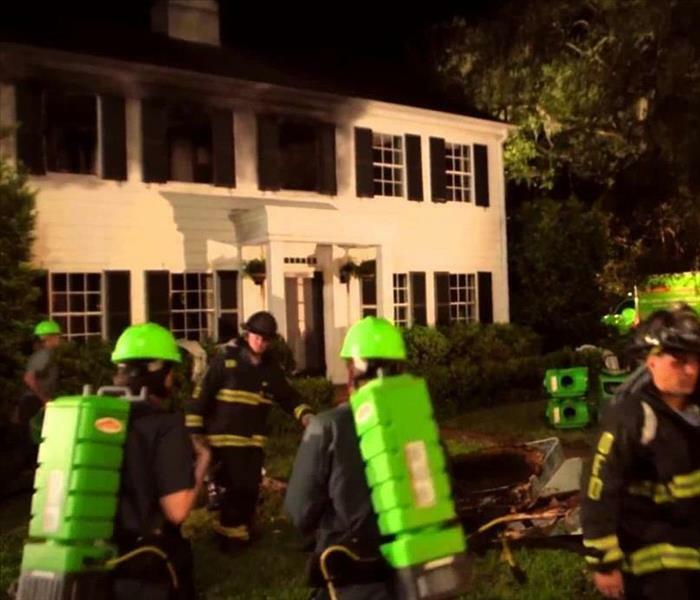 We were called out in the middle of the night after a home owner was awaken to a grease fire stated in the kitchen by his brother who feel asleep while cooking. SERVPRO of Bowling Green and W. Lucas County was able to put the home owners mind at easy and made it "Like it never even happened." Here is a basement from a clients home in Liberty Center Ohio. We were called out when a home owner discover standing water in her basement. Although the water was not high her stress level was. SERVPPO of Bowling Green and W. Lucas County came out extracted the standing water. Dried the area and sprayed a anti-microbial solution. As the water receded so did the home owners stress. 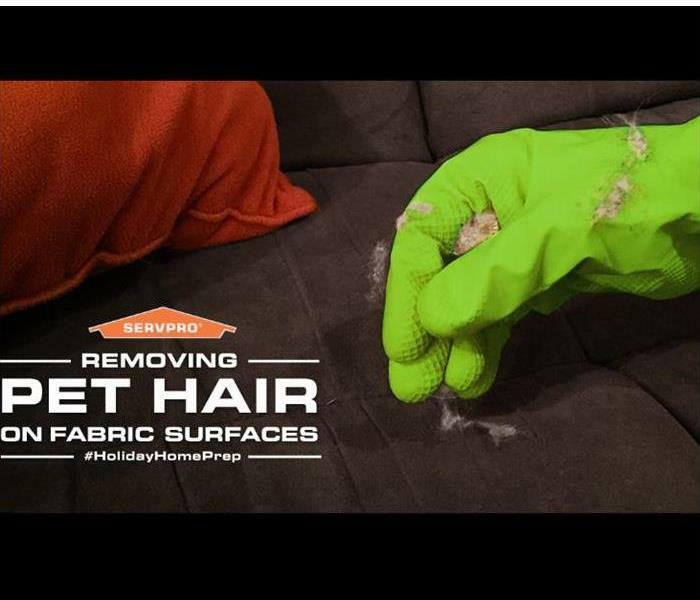 Here at SERVPRO was want to make it "Like it never even happened." to help you get on with your busy life. 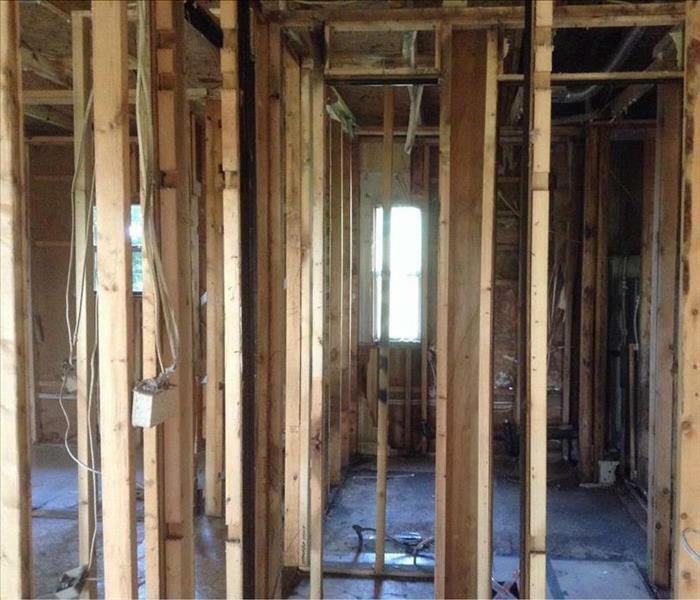 After many hours, sweat and determination SERVPRO was able to get the house cleaned up and ready for the owners to start rebuilding their home. 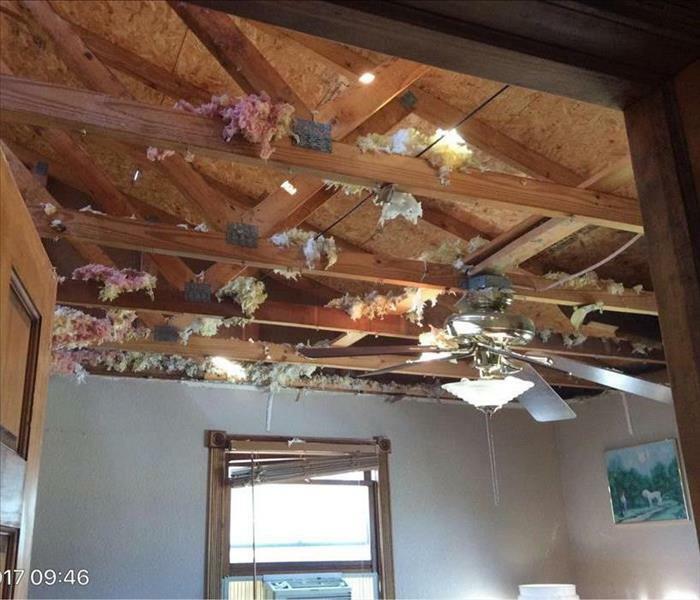 Owner was replacing his roof when a unexpected storm passed through devastating his whole house. SERVPRO came out and cleaned up the house as well as the contents. 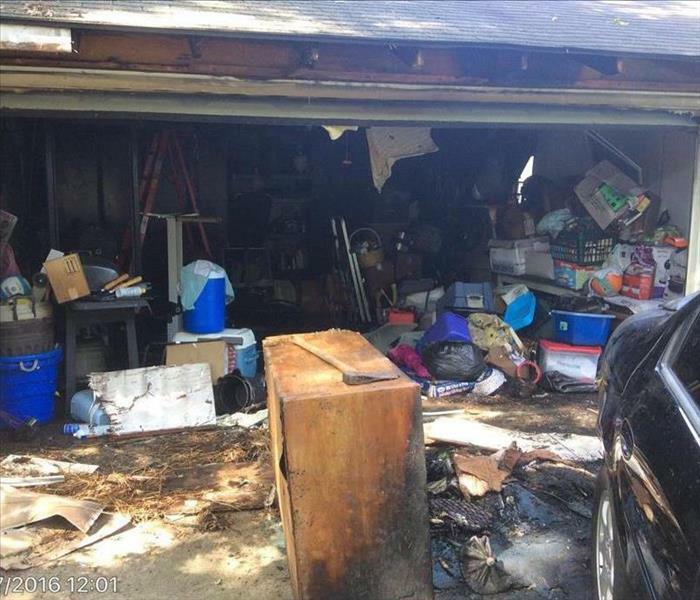 SERVPRO was called out to clean up after this garage fire that also caught part of their vehicle on fire. 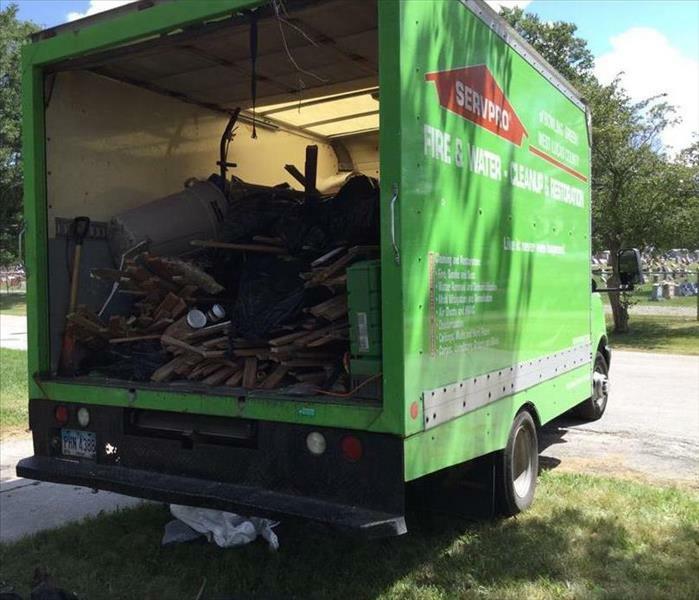 SERVPRO packed out and cleaned their contents an disposed of the non-salvageable items. The garage ended up not being saved but the memories that it stored inside were. This was the aftermath of a kitchen flood in Montpelier when we arrived on the scene. 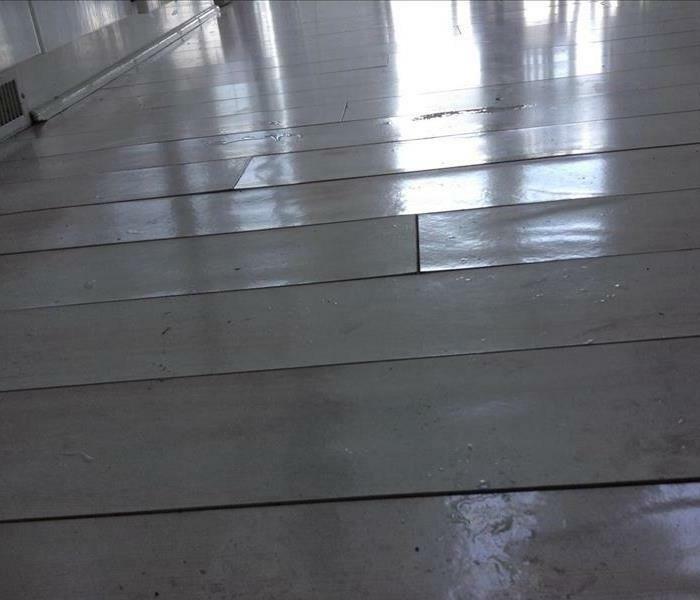 There was significant moisture damage to the flooring. 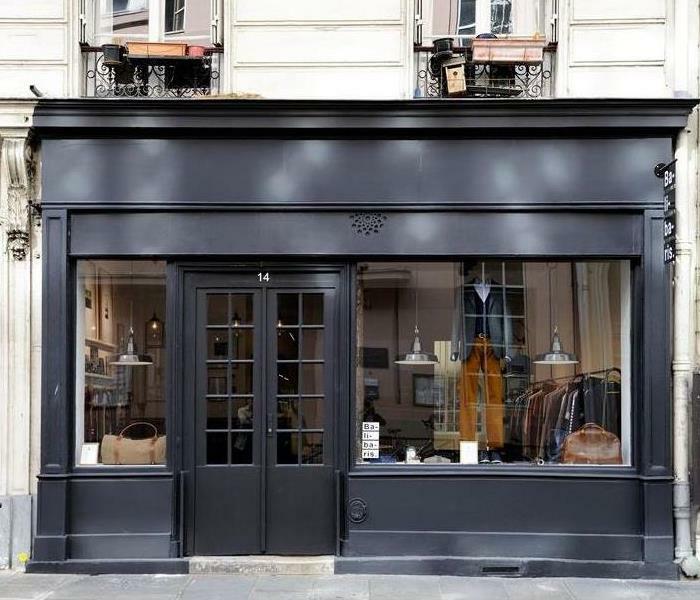 The owner couldn't believe how quickly and completely we were able to clean area and make disasters "Like it never even happened."